The total area of 360 sq. 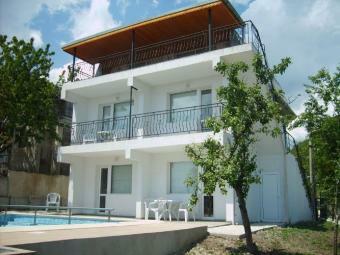 m.
situated in northern Bulgaria, 40 km from Varna and 70 km from the state Romania. Balchik - one of the most ancient Greek colonies along the Black Sea. It was founded more than 2 and a half thousand years ago. The city is located echelon against the backdrop of the picturesque coastal white cliffs. Balchik is famous archeological monuments of ancient times and high quality are grown here the local grape varieties. -Level 3 - one big apartment. Spread in the courtyard pool.